Breakfast is all about optimism. The sun is shining as we sit down to our meal — be it a decadent plate of eggs and bacon or a virtuous little bowl of fruit and chia seeds — and, for a moment, whatever went down the night before or waits for us in the day to come is irrelevant. L.A. is rich in places offering great breakfasts every day of the week, so you don’t have to wait for Sunday brunch to roll around to enjoy an excellent morning meal. Whether you’re meeting up with friends or taking your toast alone (just you and your Instagram followers), these 50 spots will have you starting the day strong. 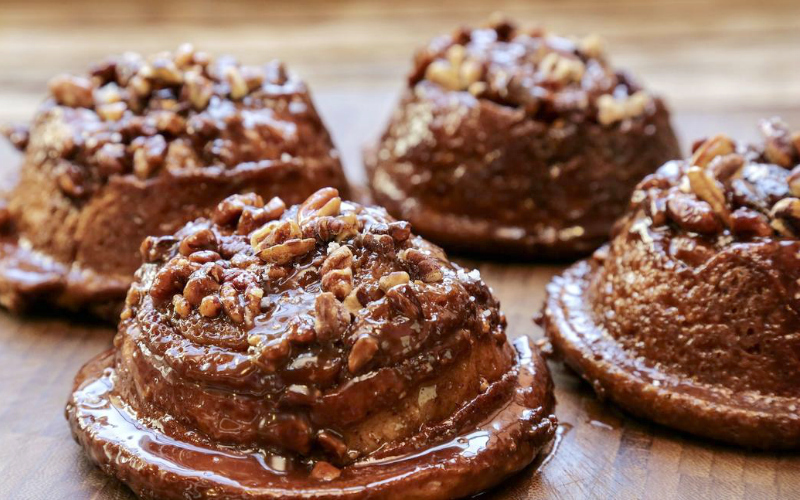 Amara Kitchen has something for every breakfast lover, even the vegan, gluten-free, and paleo-dieting one. Everything in the cheery spot is certified organic, as well, but with options including pumpkin pancakes and saucy egg pots, you won’t feel like the healthiness comes as a compromise on taste. Ah, at last Los Angeles got a taste of the Dominique mystique. After we watched from afar as the Cronut craze devoured the sanity of NYC (at the height of the madness, scalpers were allegedly charging $100 a pop for the coveted, crispy pastries), we now have our very own Cronut sanctuary nestled in The Grove. But while pastries are Ansel’s claim to fame, head to 189 for the bonafide breakfast dishes. You’ll find the softest scrambled eggs, some of the best pancakes in town, perfectly cooked salmon, and the lamb merguez sausage of your dreams. This pair of popular spots for Italian-accented sandwiches and sweets opens up early (Beverly at 8 a.m., DTLA at 9 a.m.) for breakfast, which includes breakfast panino, frittata, and several options for upgraded toasts. A favorite with Burbank dwellers, this homey spot serves up classics like pancakes and scrambles, and always whips up special treats (think minty red-and-green Christmas pancakes or French toast stacks topped with Oreos, peanut butter, bananas, chocolate, and marscapone cheese). Blu Jam keeps opening new locations (they even just opened a Tokyo location), but that hasn’t seemed to ease the crowds. Prepare to settle in for a bit of a wait for a table at the no-reservations cafés, but have faith that your patience will ultimately be rewarded. Three friends from New York opened Bolt imagining it as a simple coffee and breakfast burrito spot, but as it became a hit with neighborhood regulars, offerings have expanded to include a full menu and elaborate bakery program. They didn’t forget about the breakfast burritos along the way, offering bacon, sausage, and vegetarian variants. There’s a new menu each month at this market-driven café, but you’ll never go wrong with an order of the Turkish eggs (poached eggs with aleppo-urfa butter, garlicky sheep’s milk yogurt, charred scallions and lemony salad, served with cornmeal focaccia), or the almond-orange breakfast cake served with local fruit. Botanica also has a menu of garden-inspired breakfast cocktails, if coffee isn’t what you crave. The breakfast menu at Salt’s Cure proved so popular that the owners recently opened this morning-only spinoff location, where you can now dig into the cult-favorite griddle cakes (now available in five different flavors) on a daily basis. Breakfast can be treacherous for vegans, but Café Gratitude’s sunny, all-vegan spots offer a chance to avoid any “Can you leave off the egg, please?” awkwardness. Even omnivores will appreciate the lengthy list of smoothies, tonics, and other healthy day-boosters. You come to Cereal and Such when you want cereal. Maybe it’s a nostalgic classic you haven’t tasted in years, maybe it’s an esoteric import from Japan that you can’t get anywhere else. Selections rotate, but you’ll likely find something you want to spoon up. Walk up to the window, place your order, and enjoy your bowl on a charming, art-filled patio. Asian influences pop up on the all-day breakfast menu at this café that’s just off the beaten path downtown. The most popular call is The Beiber, an ooey-gooey breakfast sandwich with scrambled eggs and a Thai fried egg, plus spiced chicken sausage, a cheddar cheese crisp, and a slather of sriracha-yuzu mayo. Bonus: It’s the rare DTLA joint to boast a free parking lot. All your breakfast faves are here — oatmeal, scrambles, huevos rancheros — and they’re done consistently well, but if your attention is entirely captured by the bountiful bakery case, we certainly couldn’t fault you. Coffee Commissary has several locations, but only the Burbank outpost also hosts a full kitchen. Hit them up for various egg sandwiches, avocado toast, or even a pork belly breakfast burrito, but whatever you do, make sure to get it with a side of the triple-fried potatoes which will change everything you thought you knew about morning spuds. Why save fancy, modernist cuisine for dinner? At Destroyer, you’ll be treated to daytime fare from the creative mind of Chef Jordan Kahn, the same person who helms the so-buzzed-about Vespertine by night (and at a teeny fraction of Vespertine’s price, of course). With prime Venice real estate and perfectly ‘grammable breakfast bowls, this newcomer has already amassed a devoted following. You’ve heard it all before—avocado toast, smoothie bowls, breakfast burritos—but somehow Great White has so perfectly captured the current spirit of Venice that it’s a hard spot to pass up. The warm, buttery biscuits at Division 3 are so good, even a Southerner would write home about them. They can come stuffed with really excellent egg sandwich fillings (try the fennel-cured salmon, soft scrambled egg, and chive-creme fraiche combo, or the classic bacon, egg, and cheese with “special sauce”) but are also divine all on their own, with just a smear of seasonal jam. Be it a bagel, loaf of bread, or pastry, pretty much anything that bakes in an oven is going to be a winning option here — and that includes, of course, the numerous toasts, sandwiches, and other bread-adjacent items. Just order all of them. And then grab a croissant while you’re at it. Gjusta isn’t just a place for West Side cool kids to see and be seen, though, let’s be real, it is absolutely that, and they know it. But, scene or no, the food is really, really good, and the savory-leaning breakfast menu is all hits, from the brown rice mushroom bowl with greens, fermented chili and fried egg, to the house-baked bialy topped with egg, merguez sausage, arugula, harissa, and gruyere cheese. Most folks make their way to Go Get ‘Em Tiger for the coffee, which remains among the best in town. But if you’re planning to sit for a spell and enjoy your drink, maybe you should have something to eat too, right? To sate you, they have a full menu of Mediterranean-leaning dishes, like a green shakshuka or a breakfast couscous salad with snap peas, asparagus, and burrata. Honey Hi is the sweet little café everybody wishes was in their neighborhood. Stop in starting at 9 a.m. for all-organic, all gluten-free bowls, toasts, and sandwiches, washed down with healthy smoothies or reishi hot chocolate. You can add an avocado to anything on the menu, and perhaps you should. Everything at Huckleberry feels wholesome and home-spun, right down to how they source all their ingredients: All organic, GMO-free, and locally-grown. They’re happy to tell you all the details, like the ranch that raised the cow that became your brisket (Creekstone Farms) or where the fingerling potatoes served alongside it were grown (Weiser Farms). Sometimes you’re looking for a power breakfast, and Ivory on Sunset, with its expansive views and high-end style, is a perfect spot. A historic house on York recently converted into a restaurant, Jane maintains a cozy, homey feel. The extensive menu runs the gamut from omelettes to pasta; the brioche French toast soaked in orange zest créme brûlée batter, topped with banana and orange is a particular treat. Do you like pizza? Do you like breakfast? Well, Jon and Vinny have a little something just for you, and it’s called breakfast pizza. And while, ok, they may not have invented the idea, they have pretty much perfected it — and then gone and created five different versions. Don’t forget to order a bombolone doughnut (seen above) to go along.